“It’s clear that Larson cares about the craft of writing. She forges compelling characters and supports them with a thoughtful scaffolding of themes. 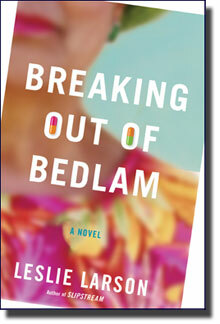 Breaking Out of Bedlam is a good read: funny, sad and easy….The novel squeezes a remarkably full life and personality into a surprisingly fast pace.… Breaking Out of Bedlam shows, without being cloying, that life can take abrupt turns when least expected. 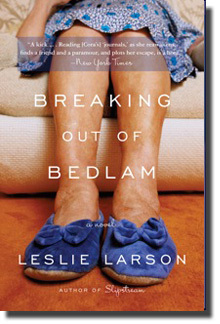 "Few women have kept me as worried and curious and awake at night as Cora Sledge, the ‘heroine’ of Leslie Larson's great new novel. Her life is huge, and tragic, and comic, and stalwart, and her voice is astonishing. Read this novel to see redemption." "As Leslie Larson reminds us in this brilliant novel, everyone in L.A. is just three degrees of separation from the next small apocalypse." 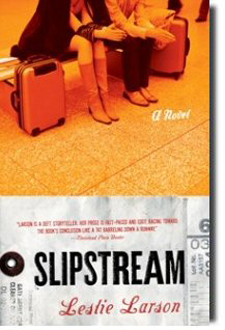 "This exceptional first novel is pitch perfect in its authentic, insightful portrayals of fatefully intersecting lives amid the edgy anxiety of our post 9-11 world. The writing is pure pleasure—as clean and clear as glass." "Leslie Larson may just have appeared in the world of trade publishing, but she brings with her a formidable set of tools. She writes an observant, easy-moving, sea-level prose, honest to the core, and this instrument allows her to slip out of the head of one character and move directly into the head of another, with no time off for editorializing or point-scoring. It takes enormous discipline to write this way, as well as an unshakable confidence in one's capacity fully to inhabit one's characters—here, a raffish, scrabbling, aimless set of losers and the unhappy, yearning characters attached to them, each brought vividly into wriggling, yammering life by Ms. Larson's unerring talent. 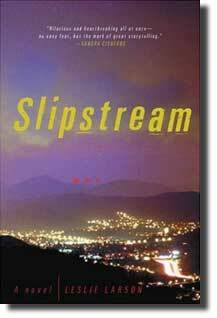 Slipstream demands to be read from start to finish, if at all possible in one long, shivering gulp." © Leslie Larson, 2010. All writings and artwork on this website are the creation and copyrighted property of Leslie Larson and may not be reproduced in any form without the express written permission of the author.